First it is an honor to speak with you , I follow his work with Rage and Knorkator bands and be very surprised with the news that you are the newest member of Evanescence . The fan condition would love to congratulate her and thank her because I'm sure that their entry into the band will add a lot to the world of rock . Sara Sthefany: When did you decide you wanted to be a professional musician? Jen Majura: It was always clear to me that I wanna become a musician, I skipped this time of “I wanna become a vet” etc. At the age of 4 I told my parents that I wanna do music, so I started with piano lessons pretty early until at the age of 8 I found my way to guitar, my ever since then leading instrument. By the years I learned several instruments, but guitar is where my home base is. Sara Sthefany: The guitarist condition , which by the way you have more than talent, has the gift, there is some pressure because you being a woman and stand out in between which is still considered sexist or a man's world? Jen Majura: The pond of female guitar artists worldwide is a very very small one for sure. And of course it is hard to constantly work in a (let’s be honest here) “male” kind of business. But I don’t wanna run any competitions with either my male or female colleagues. I think Amy Lee is, beside the fact that she’s an extraordinary vocalist and musician in my opinion, one very strong great personality and I am really honored and proud to be working with her and the guys in Evanescence! Sara Sthefany: In your career , what are the biggest obstacles you faced? Another fact would be “being a woman” can be beneficial, but also adversely in some points. But all in all I am a very happy person, blessed with loads of good stuff and few obstacles in my life. Sara Sthefany: Do you have a solo album called Jen Majura I have not heard completely, but the previous it can be concluded that it is a great album . You were part of the production and composition of it? What is your favorite song from his album? Sara Sthefany: About Evanescence . It's a huge surprise to be announced a new member and higher still for being an extremely talented and beautiful woman. As soon as I heard the news arrived already loving you hahaha . What is your first reaction upon learning that would be part of the band? You and Amy Lee already knew ? 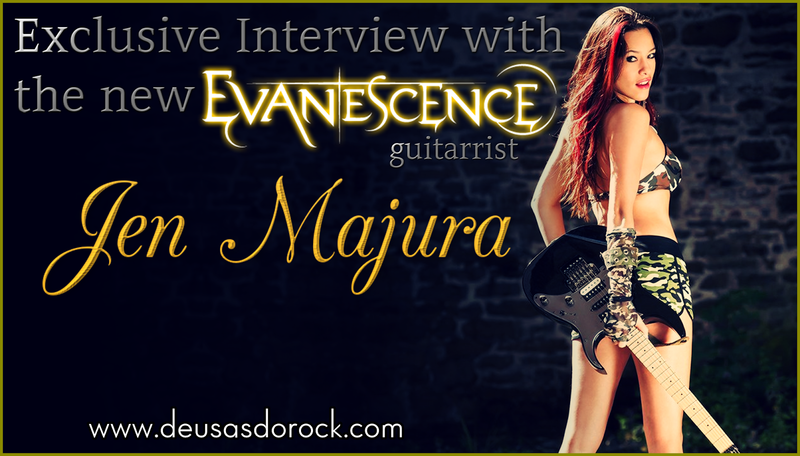 Jen Majura: I received an email with the request for joining of Evanescence’s management one evening while I was playing and practicing guitar. My reaction? – I couldn’t believe my eyes and I think I stoped breathing for some minutes hahahaha. No words can tell how honored, excited and happy I am! Sara Sthefany: This question is controversial: you will play the guitar only or do backing vocals on Evanescence ? Sara Sthefany: Two women in a world acclaimed rock band. Are you aware that receive much attention from fans and the general public . This type of harassment bother you? Jen Majura: The fan base of Evanescence worldwide have welcomed me in such a beautiful warm hearted way, that I could never ever think of this as a “harassment”. Sara Sthefany: What can not miss in your suitcase when you're on tour and why ? Sara Sthefany: With its entry into the Evanescence his facebook page was bombarded with comments from Brazilian fans . All this madness and affection we have for you makes you want to come play in Brazil faster or scare you? Jen Majura: I can’t wait to finally come to Brazil!!! I have travelled a lot in my career, been to Mexico earlier this year to perform a show and I am so excited to see more of South America and the entire world, especially Brazil is a place I wanted to travel my entire life. Jen Majura: It’s like a dream come true. Sara Sthefany: I would love you to leave a message to all his fans and fans of the band here in Brazil . Jen Majura: I just can’t wait to come to your beautiful country and rock the stages together with Amy Lee and the guys for you all! I’m so excited about the future right now. Thank you very much.